Children’s mental health is an important part of their overall well-being. To help guide parents, the American Academy of Pediatrics offers a collection of interviews with pediatricians about child behavior, emotions and other mental health topics. Click on the questions or descriptions below to hear responses to individual questions, or click on the link to listen to an entire interview. Dr. Thomas K. McInerny is the 2012-2013 president of the American Academy of Pediatrics. He has been a pediatrician in private practice in Rochester, N.Y., for 40 years and is a professor at the University of Rochester Medical Center and Golisano Children’s Hospital. He served on the AAP Task Force on Mental Health, which developed the AAP Mental Health Toolkit. What signs of healthy emotional development do pediatricians look for in infants and toddlers? What issues do pediatricians address in school-age children? Why do pediatricians want to speak privately with adolescent patients? How can parents coordinate mental health care with their pediatrician? David J. Schonfeld is a developmental-behavioral pediatrician. He is director of the Division of Developmental and Behavioral Pediatrics and the National Center for School Crisis and Bereavement at Cincinnati Children's Hospital Medical Center. Jane M. Foy, MD, FAAP, is professor of pediatrics at Wake Forest University School of Medicine in Winston-Salem, N.C. and chaired the AAP Task Force on Mental Health from 2004-2010. John Duby, MD, FAAP, is director of Developmental and Behavioral Pediatrics at Akron Children’s Hospital in Akron, Ohio, and a professor of pediatrics at Northeast Ohio Medical University. He is the chair of the AAP Mental Health Leadership Workgroup. How do you instill good habits in your children? What’s the best way to praise your child? What are effective strategies for discipline? How do you handle aggressive behaviors? What discipline techniques are effective for grade school-age children? In teenagers, how do you strike a balance between independence and boundaries? How can parents encourage siblings to get along? What role does the parent’s behavior play in children’s emotional development? Pediatrician Karen Soren, MD, FAAP, is director of adolescent medicine and associate clinical professor of pediatrics and public health at Columbia University Medical Center in New York. Studies show 1 in 5 children has a mental health disorder. Who does that include? Are some children at higher risk? 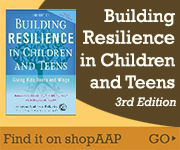 How does anxiety or depression manifest in adolescence? What behavior constitutes an anxiety disorder? Are there positive coping methods parents can teach their children? Is it normal for teenagers to be moody? How common is suicide among teenagers? How important is it to get treatment for anxiety or depression? Are anti-depressants safe for adolescents? What advice do you have for parents struggling to find someone to help their child? Marian Earls, MD, FAAP is a developmental and behavioral pediatrician in Greensboro, North Carolina, and she is a past member of the AAP Committee on Psychosocial Aspects of Child & Family Health. How common is post-partum depression? What populations are most at risk? What are the signs that a woman should seek some help? Where should mom go to start getting help? In terms of treatment, what’s effective? Are antidepressants safe if you’re breastfeeding? What can families do to protect women? How does post-partum depression affect children? Mary Margaret Gleason, MD, FAAP, is a pediatrician, psychiatrist and child psychiatrist at Tulane University School of Medicine. She is a member of the AAP Committee on Early Childhood. What does infant mental health include? What can happen if a toddler does not have healthy relationships? How can parents nurture their young child’s emotional development? Can you talk about colic? What do you do when your 7-month-old cries at day care drop-off? What’s behind temper tantrums? When do they end? What infant/toddler behaviors indicate a mental health problem? If a parent is worried, what should they do? Garry Sigman, MD, FAAP, is a specialist in adolescent medicine and an associate professor of pediatrics at Loyola University Health System in Chicago. What do parents need to understand about their teenager’s emotional health? What role do peers play in adolescents’ emotional and social development? Are there also problematic influences friends can have? How can parents encourage open communication? What are warning signs a teenager might be struggling? What steps should a parent take if they notice those things? What are signs your child may be bullied? What can parents do to build their child’s self-confidence? What’s your best advice for parents to foster good mental health? What’s changed in the AAP guidelines on ADHD? What does AAP recommend for children who don’t quite meet the criteria for ADHD? How is ADHD diagnosed in preschool-age children? How is ADHD treated in grade school-age children? How safe are stimulant medications? How is ADHD managed in adolescence? Do you have any final advice for parents?